The essential guide to the heroes and villains of the Marvel studios movies. Learn the facts, figures, super-powers and origins of your favorite characters from the Marvel Cinematic Universe (MCU). From the Avengers and Ant-Man to Black Panther and Doctor Strange, this book spans over a decade of action-packed Marvel Studios movie releases. 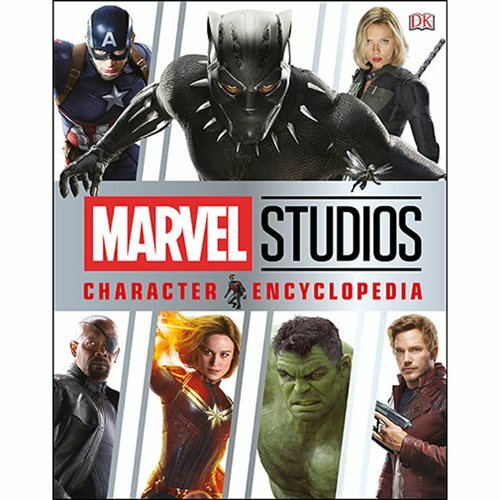 Filled with interesting facts and key information, whether your favorite hero is Captain America, Black Widow, Thor, the Wasp, Iron Man or Gamora, you'll be able to find out all about their story, super-powers, weapons, and much more. It isn't all heroes though; this book includes powerful villains and their followers, sinister spies, brave soldiers, and even ordinary people who find themselves caught up in epic battles! Whatever it is that you want to know, Marvel Studios Character Encyclopedia Hardcover Book will make you an instant Marvel Studios expert. Wondering what Thor's hammer is called, or where Vision came from? How Iron Man builds his suits, or who Thanos is? Then this is the book for you! The 176 page book measures about 9 1/5-inches tall x 7 1/5-inches wide.